The Roman emperor Marcus Aurelius (121–180) was a Stoic philosopher. Stoicism was a complex philosophy that advised people to find happiness by living in harmony with the universe and by doing their part to better the world—without worries about fate or about things they were unable to control. When Marcus Aurelius became emperor there was widespread celebration that Plato's dream of a philosopherking had become reality at last. Born Marcus Annius Verus on April 26, 121, of a noble family, Marcus Aurelius Antoninus grew up close to the center of power. When he was a child, the emperor Hadrian (76–138) noticed him and made a word play on his name, Verus (meaning "true"), by calling him Verissimus (meaning "truest") for his strong sense of morals. Hadrian had difficulty choosing an emperor to follow him, but placed Marcus on the path to rule. When he adopted Marcus's uncle by marriage, Antoninus Pius (86–161), he arranged for Antoninus to adopt Marcus Aurelius along with the young Lucius Verus (130–169). Marcus Aurelius had an extraordinary education. Among his tutors was Diognetus, a painter and Stoic philosopher. Marcus studied subjects such as poetry and law, and generally was an excellent student. But philosophy was Marcus's main interest. Under Diognetus's influence, young Marcus became a Stoic at the age of eleven and remained a dedicated follower of stoicism for the rest of his life. Antoninus Pius, only a year after he became emperor, had the title Caesar placed on Marcus in 139. His daughter Faustina probably married Marcus in 140. Throughout the reign of Antoninus (ruled 138–161), Marcus worked closely with him. When Antoninus died and Marcus became emperor, he insisted that Verus also be given full power. Thus, for the first time, Rome had two equal emperors. The reason this arrangement did not produce conflict between lifetime equals was due in large part to the good nature of Verus and his acceptance of Marcus's seniority in years and judgment. When Verus and Marcus first became joint emperors of Rome they faced the problem of war in the East. Parthia (located in present-day Iran) was always a rival for power in Armenia, and in 162 Parthia attacked. Marcus Aurelius remained in Rome and sent Verus to take charge of the war. Although Verus was not a trained soldier, the war carried on smoothly. But in late 165 a plague, or very contagious disease, broke out among the Roman troops. They carried it back with them and the plague killed a quarter or more of the population of the Roman Empire. Rome recalled its armies from Parthia, defeated but not conquered. Nevertheless, Marcus and Verus celebrated a great triumph. The Parthian War had ended none too soon, for the German War had already begun. In 167 a group of tribes crossed the Danube River, destroyed a Roman army, and successfully conquered a city in Italy. The danger was critical, for the plague was raging, particularly in the army camps. Also, the Roman treasury, always short of money, was worse off than usual. Marcus raised new armies and funds and in 168 went with Verus to the battlefront. Verus died in early 169, and Marcus was left to face the war alone. The Germans were driven back, but the war dragged on, with Marcus mainly at the battlefront. Gradually the Romans gained the upper hand. But by 175 Marcus had to call off the war because of the revolt of Avidius Cassius in the East. After his service in the Parthian War, Avidius Cassius, a Syrian, had been made governor of Syria and held great power. In 175 Marcus grew sick and it was rumored that he was either dying or dead. Partly for this reason Avidius was hailed emperor and accepted by most of the East. Marcus had to break off the war in Germany and hurry eastward. Cassius was murdered three months later and his body was sent back to Rome in late 176. The German War started again in 177, and Marcus returned to the battlefront. Once again he was winning the war. However, Marcus died on March 17, 180—never to see the final victory over the Germans. Marcus Aurelius is most remembered for the collection of his thoughts or reflections usually entitled The Meditations. Apparently written down from time to time, the thoughts form no organized system of philosophy. Rather, they are the record of a person whose principles were noble, who had a warm love of humankind, and who had a philosophy similar to religion. To Marcus, happiness was to be achieved by living "according to nature," in harmony with the principle that ordered the universe; the peace of mind of such a person could not be affected by life's difficulties. Birley, Anthony. Marcus Aurelius: A Biography. Rev. ed. London: Routledge, 2000. Farquharson, Arthur S. L. Marcus Aurelius: His Life and His World. Westport, CT: Greenwood Press, 1975. Sedgwick, Henry Dwight. Marcus Aurelius: A Biography. New Haven, CT: Yale University Press, 1921. Reprint, New York: AMS Press, 1971. 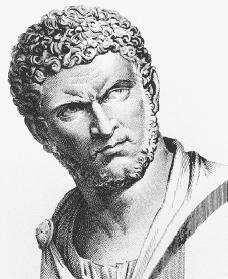 Please note that the image is of Caracalla not Aurelius. The editor should pay more attention when using graphics. I tracked this site down because that image is all over Facebook and attributed to Aurelius. Now bad info is out there for good and will be perpetuated every high school report from now on. Thanks for screwing up the biography.